After last week’s walk down cupcake memory lane for National Cupcake Week, I thought it might be nice to do the same with some of the cookies I’ve made over the past year and a bit. It’s not National Cookie Week where I am, but it maybe is somewhere in the world!! When we think of cookies in the UK, we tend to think of chocolate chip cookies, American style. But the Americans seem to class lots of different treats cookies, including meringues! 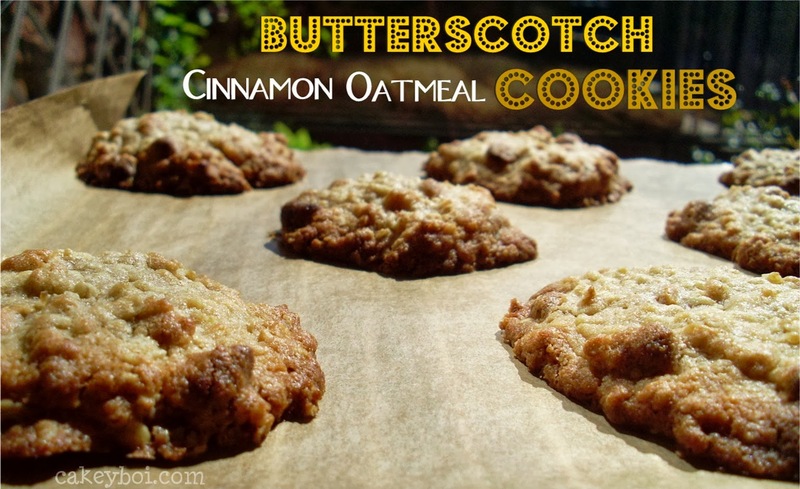 First out of the gate are my Butterscotch Cinnamon OatmealCookies. It’s funny to look back on this post as I’d only been writing the blog for less than two weeks. The butterscotch chips are an American product, which I picked up in Glasgow, but since then I have seen butterscotch pieces popping up in our supermarkets. Secondly we have my Double Stuff Custard Creams. I love Oreos, but even more than Oreos, I love Double Stuff Oreos. Double the filling is very indulgent and I thought why not try this twist on classic British Custard Creams? My Caipiroska Cookies are based on a drink that we have when Disneyboi and I go to Portugal. The ingredients of the drink are vodka, brown sugar and lime. Of course I had to try and use these in cookies and the results were pretty darn tasty! Please eat responsibly with these!! At Halloween time I made these cute blueberry and white chocolate cookies, which I christened Booberry and White Shockolate Cookies, The cookies themselves were good, but ghost mallows really topped them off! At Christmas time I was asked to write a guest post for a fellow food blogger – Stephanie over at Kitchen Frolic who was hosting a Christmas Cookie Advent Calendar for the season. I was thrilled to be asked and made my Gingerbread bois. They were supposed to look like Cakeyboi, but truth be told I was a tad disappointed in the result. Maybe something to dust off this Christmas? Valentines day was around the corner and I wanted to come up with something pink and garish. 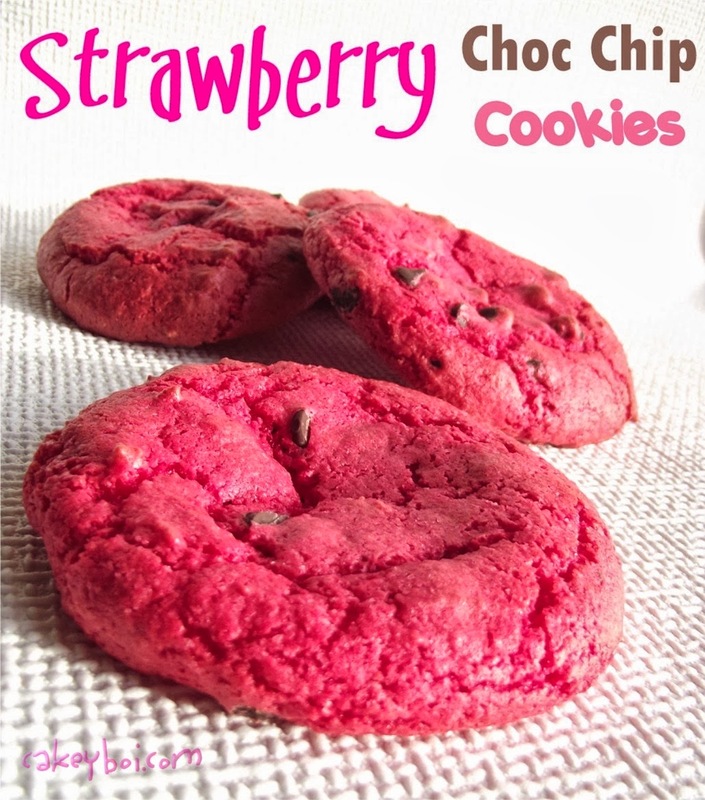 These Strawberry Chocolate Chip cookies were certainly that. And what was even better was the fact they were made from boxed cake mix! Boxed cake mix is very versatile and has way more uses than just cake. 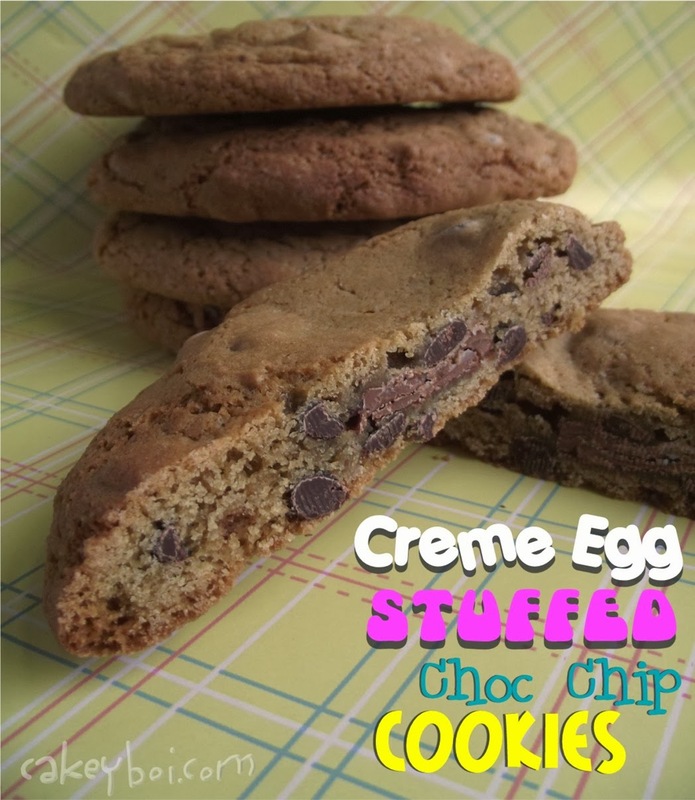 At Easter, I came up with the idea of baking a Crème Egginto a cookie. When I saw Crème Egg Splats in the shop I thought these would be ideal as they were flat with all the taste of said egg. They were good, but I wished now I had stuffed a mini crème egg in there instead – this would’ve been even better!! And now we are half way through GBBO, there is someone sticking out for me, for all the wrong reasons. Sadly, I think time could be almost up for Frances. Her designs look pretty enough, but the outcome doesn’t always taste impressive enough from what the judges are saying. Even kindly Dame Mary of Berry has been less than her usual diplomatic self. Flavour first, looks second I think is the message! You are a very talented baker, Stuart. Great idea for a post. I want the chocolate cream egg cookies! You'll have to wait 'til Easter Jac lol!! How did I miss those caipiroska cookies when you first featured them? They look awesome!!! They were very very tasty! !